­This is not a matter that is up for determination, neither by you, nor by the Lord Lyon, nor the Queen of Britain, nor all the inhabitants of Scotland. The existence of my clan is an irrefutable fact made evident by the many thousands of my clansmen who bear our clan's name. And out of those thousands, they all decided to make an OCD welfare case their chief. The matter is also not yours to determine then. It is because I am der Dwarfenfuhrer. ­No, the matter was determined by a derbfine of my clan. Why would Akins petition the Scottish courts if he says they don't have any legal recognition??? With Akins it's obvious, the moment he's denied something, it's the Jews fault. The moment he gets banned from VNN, he suddenly discovers Linder is a Jew. I can see it now when he was banned over and over from F2, he was crying Jew.
. said: Why would Akins petition the Scottish courts if he says they don't have any legal recognition??? ­You seem to be confusing things here. I petitioned to have my ancestral coat of arms recorded in Lyon Register. Yes, Akins, we all know about your document forgeries. 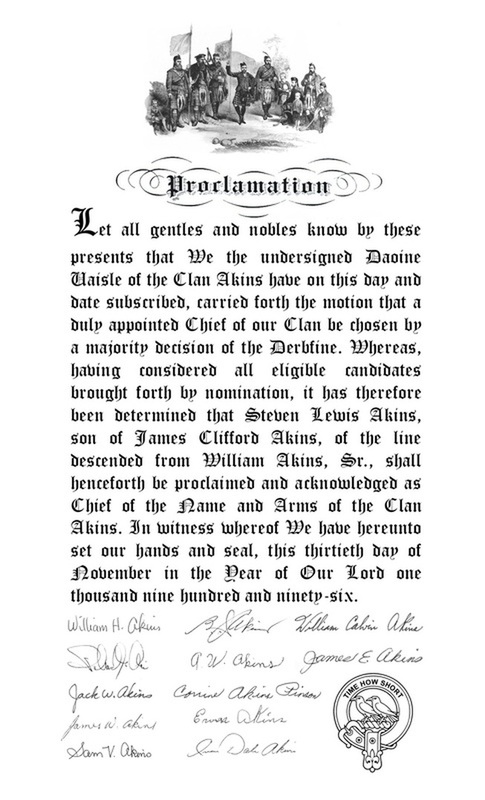 A proclamation done by Akins himself, and just getting his family members to sign it, or in the case of Akins history, probably all forged names. Thus you were asking them for some sort of recognition and when you didn't get it, they suddenly had no jurisdiction and were controlled by Jews. Hey Steve, where's the document of your father being named clan chief???????
. said: Hey Steve, where's the document of your father being named clan chief??????? ­My father wasn't interested in the position.
. said: A proclamation done by Akins himself, and just getting his family members to sign it, or in the case of Akins history, probably all forged names. ­The issue of having my ancestral arms recorded in Lyon Register is an entirely separate matter from my position as ceann-cinnidh. Having one's arms recorded in Lyon Register is a formality which I had petitioned as a courtesy. But yet you list him as the 37th hereditary clan chief of Akins. But now you are saying your father was never one. Akins is also photographed in the 90s wearing a kilt from another clan.
. said: But yet you list him as the 37th hereditary clan chief of Akins. ­If you think that is confusing, you should look into the line of succession for the chiefship of the late chief of the Clan MacLeod. Stick on topic. You claim your father was the 37th hereditary clan chief but now you are saying "he wasn't interested in the position". So in either case, you just lied. No amount of you changing the topic or going into a manic ranting phase will change that.
. said: Stick on topic. You claim your father was the 37th hereditary clan chief but now you are saying "he wasn't interested in the position". ­He is still counted as an honorary holder of office. Where is that wee lad? Is he planting another forged headstone?